Speedway is known to have taken place in at least 4 different venues throughout the Barrow in Furness region. The first recorded meeting took place at the Holker Street Stadium on 21st June 1930, taking advantage of the facilities enjoyed by the Barrow Footbal League team. Much later the team dropped out of the Football League and played in the Conference and Northern Premier League. 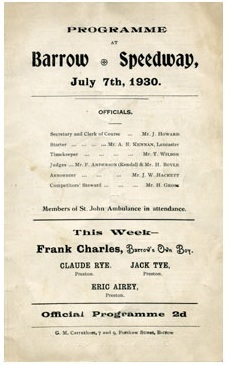 This first stint was only to last until 28th July 1930. They found a new home for the 1931 season at Little Park in Roose. The team did return to its former home at Holker Street for the 1972 to 74 seasons when competing in the British League Division Two. However, possibly their best period of success was when they moved to Park Road Stadium, staging their first meeting on 16th August 1977. The team have been known at various times in their history as the Bombers, Happy Faces, Blackhawks and, not surprisingly, the Furness Flyers.